Prove That You’ve Purged Your Old Games, Win More Stuff! Maybe you just moved in with your lady friend and she put her foot down as to many games you can bring into her precious, fancy girl house. Or perhaps your mom did something similar. Or possibly, just possibly, you made the decision yourself, after hearing about Best Buy's awesome trade-in program—either way, the deal is about to get a whole lot sweeter. 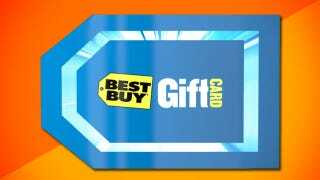 If you've recently taken advantage of Best Buy's trade-in program—where you hand over your old games, and it return receive gift cards good for anything in the whole store—then we want proof. Send in a photo of your receipt, and you'll be entered to win even more Best Buy gift cards, so you can get even more games (or anything else that your little heart desires). To enter, send your evidence in to contests@gawker.com with "Best Buy Trade-in Contest" as the subject line by October 20. We'll be choosing a handful of readers at random, and their prizes will be dependent on how much their receipts are for. So if you've traded-in a lot, expect a whole lot back. For more info on how to maximize your trade-in power at Best Buy, head here now. Standard contest rules apply. Only open to US residents. Readers may also enter by sending the last question of the survey and their contact information to Gawker Media, Attn: Best Buy Trade-in Contest, 210 Elizabeth Street, Third Floor, New York NY 10012. The contest begins on September 21 at 11:59 am EST and ends on October 20 at 11:59 pm EST.